Refurbished IT hardware is inferior: fact or myth? thinking that at a certain point it was damaged or rejected by their previous owners. It’s the same reason why some IT professionals fear the use of refurbished IT equipment for their data centres. We can’t blame them, of course. With all the demands and expectations cast on IT’s shoulders, it is important that the data centre has to function smoothly with no or less interruption as possible. Their perception is that refurbished hardware may not perform well as compared to brand new hardware and may just cause frequent downtimes. However, judging a product to be inferior because it is refurbished is unsubstantiated. There is a lot of great refurbished IT equipment available in the market today that can equally provide superior service as the brand new ones. You can purchase refurbished servers, switches, routers and network equipment of brands like Dell, IBM, Cisco, and HP. It is time to change our thoughts about this because we are missing a big opportunity of cost savings. While it could be true that refurbished hardware was once damaged or rejected, there are various reasons why it happened and most of the time, it is not because the product is really defective. Some of the hardware was probably used for demo or equipment lease. Others came from end-users who decided to upgrade or purchase new equipment. However, refurbished IT equipment is not necessarily used. It can be an old model that has been stocked in a box, unopened and unused. The vendor won’t be pushing that product for you but, instead, offer you the latest model which is more expensive. It is like a buying a car. When you go to a car dealership, the salesman will offer you the latest model and excites you with its new features and frills. If you are a budget-conscious buyer, you would opt for the old model. It’s still the same car. It is never been used, never been driven. Where is this idea of refurbished hardware being inferior comes from? It could be a hard pill to swallow but we are wired to think that way. OEMs create new models of their hardware and push their customers for upgrades. Customers now have the option to either purchase the new equipment or buy an expensive hardware maintenance contract for legacy equipment, which by the way could be as pricey as the new equipment. At a certain point, OEMs would declare the old equipment obsolete, which they could no longer provide support. Instead, they will insist for their latest model. IT accepts the End of Service Life and End of Life declaration from OEMs as a norm in the industry. 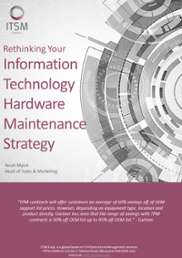 If you purchase from third-party maintenance provider or system integrator like ITSM Corporation, you will get your refurbished IT equipment bundled with services and agreement. You are also guaranteed that the equipment had undergone inspection, audit, test and update. That means there are fewer risks and you are ensured of the quality. So, yes, it is safe. IT leaders are thinking of saving costs or cutting unnecessary expenditures; however, it is difficult to break free from the IT status quo. Some are just too tired (or too lazy) to find cost-saving alternatives. Some companies don’t even take the time to review and questions the current system and practices in IT whether they are truly beneficial to the company or not. Your IT infrastructure can function the same with refurbished hardware in it. With a remarkable estimate of 50 to 90 percent savings, IT can buy essential components that will provide apparent changes and benefits to your company. So, let me say this straight: “refurbished IT hardware is inferior” is a myth. 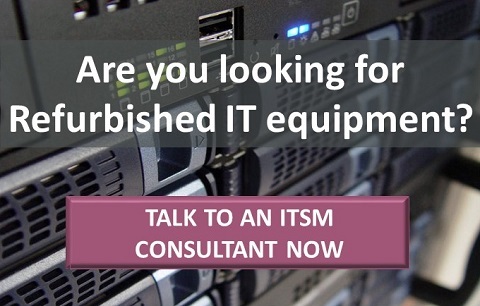 If you are looking for refurbished IT equipment, ITSM can help. Talk to an ITSM Consultant now at +61 2 8355 1080 or click the image below to book a free consultation or to discuss your requirements.